Around the age of 11 some friends and I decided we would sign ourselves up for some classes. We started with Jazz and I immediately loved it! I felt like I was “someone” when I danced. Dancing allowed me to be a part of me that nobody knew yet, not even me. I continued with Jazz and also tried Tap. I loved Tap too! Dancing made me feel good! I never held a grudge against my Mom about that ballet class. In fact, I even began taking aerobic dance classes with my Mom. The movement was choreographed based off of tap moves by a former broadway dancer. I remember getting frustrated at my first class but I stuck with it and my love of exercise combined with dance was formed! I not only continued with Jazz and Tap but I kept going to these dance exercise classes with my Mom. I was so honored when the director of The Aerobic Dance Company asked if I would like to become a teacher. I began thinking that dance and exercise was what I wanted to do with my life. I taught aerobic dance for The Aerobic Dance Company for one year, which was also my first year of college. I went to George Mason University as a Dance Major. I remember hearing people tell my Mom that she was crazy to let me major in dance but my Mom always supported me and was my biggest fan. She never doubted my choices; or at least she never showed any doubt to me. The following year I transferred to Virginia Commonwealth University to major in Dance and Choreography after auditioning and being accepted there. VCU was amazing! It was overwhelming and tiring at times but I learned so much! 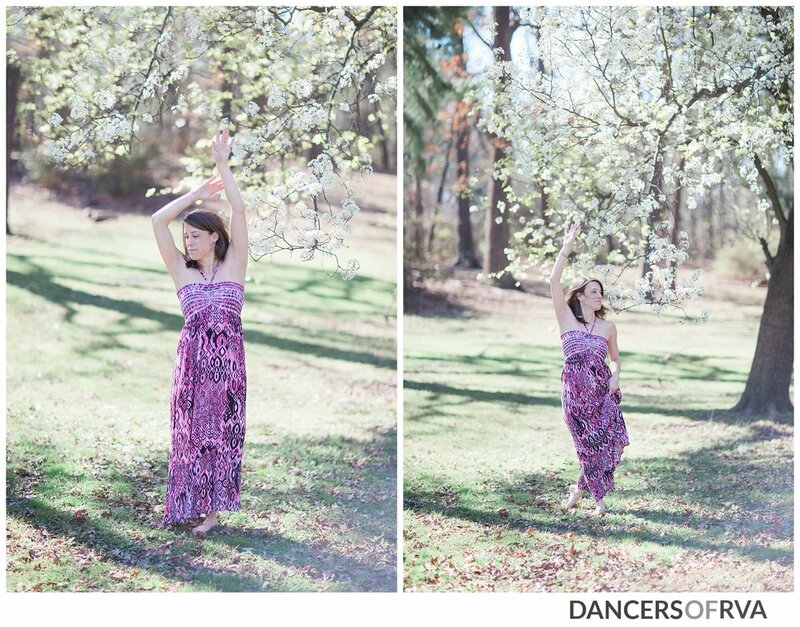 It was while I was at VCU that my love for Modern dance was formed. I will never forget the exhilaration I felt when I got to propel myself across the huge dance floor with my hair blowing behind me. Here is where I realized that there is no better feeling than finally nailing a hard, fast, sweat inducing combination that moves you all over the space. Two years into my dance degree, I decided to double major with a BS in Exercise wellness. I graduated with both degrees but because I finished last with my wellness internship, I immediately went into the exercise field as a Personal trainer. I took a few years off of dance, only taking a class here and there but I never forgot about it. While at work one day, I mentioned to a co-worker how much I missed dance and wished to return. My co-worker informed me that the company she happened to be dancing with was looking for some extras and asked if I’d like to come to rehearsal. I was so excited, nervous, anxious and happy. That was when my world was completed. Not only did I have a job in fitness and exercise, I was married to a wonderful man and we had a beautiful family and I began dancing again for Z Mullins Dance Company which later became RADAR Dance Company. I have enjoyed every second of my dancing and I look forward to continuing to dance with RADAR! When I dance, nothing else exists; I am able to leave the whole world behind me. Dancing heals my soul. I chose Bryan Park for my location for several reasons. Bryan Park is where my husband and I went on dates with our dogs. My husband propose to me in Bryan Park and built the house we live in near the park. I have many happy memories of taking my children to walk or play in the park. I often begin my day with a run through Bryan Park. I love seeing the park through the seasons but I especially love Spring as the color begins to pop out in every direction. Bryan Park brings me peace and happiness.